Click the button below to add the Pure wool handmade kid's bunny slippers to your wish list. This pair of super cute and cozy winter slippers will look great on a little girl. It was handmade by the hardworking and talented women who live in extreme poverty in Central Asia. Your purchase of this product helps to give them a sustainable income and hope for a better future. More importantly, your purchase sets a high moral standard that kids can look up to, and this item can be a conversation starter about handmade, fair trade and ethical shopping. The Master's Handicrafts is a registered export business in the country of Kyrgyzstan dedicated to helping indigenous people groups of Central Asia develop markets for their crafts. By using fair trade principles, products are bought at wholesale prices and sold to retail distributors. 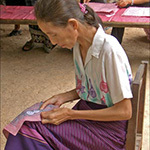 Many of the crafters with whom they work with have very little or no other income, and through the purchase of their goods, they are given the chance to grow economically.